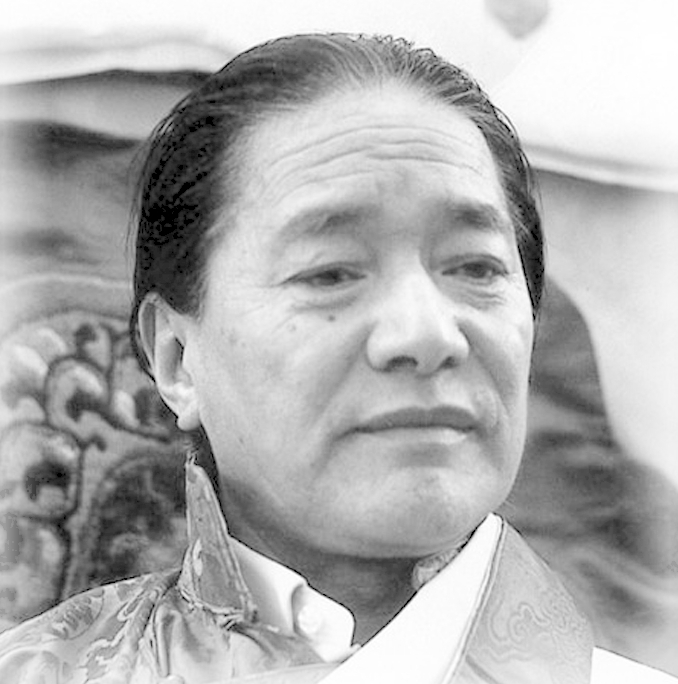 His Holiness Dudjom Rinpoche, Jigdral Yeshe Dorje, was the immediate re-birth of Dudjom Lingpa and one the greatest 20th century scholars and treasure masters. His revelatory writings are the heart essence of the wisdom dakinis and are revered as a crown jewel of contemporary vajrayana. Rinpoche lived in Tibet, Nepal, India, Europe and the USA. Thinley Norbu Rinpoche was the eldest son of His Holiness Dudjom Rinpoche. Recognized as an incarnation of Tulku Trimé Özer, one of Dudjom Lingpa son's, he was also considered an emanation of Longchenpa. In 1990, Rinpoche advised Lama Yeshe Wangmo to focus her path and activities on The Dakini Heart Essence. Repkong Lama Tsedrup Tharchin Rinpoche was the tenth generation descendant of Palchen Namkha Jigme (1757-1821), founder of Kyunglung and the 1900 Ngakpa Group in Amdo, Tibet. Rinpoche received the lineage through his grandfather, Wöntsang Druk-gyal, and then his father, Lama Chimé Dorje. Born in Kongpo, southern Tibet, Rinpoche studied with His Holiness Dudjom Rinpoche in Tibet and India. In 1984, he settled in the USA and established Vajrayana Foundation and Pema Osel Ling in California. Lama Yeshe Dechen Wangmo became a lineage holder of The Dakini Heart Essence (mkha 'gro thug thig), a treasure (terma) of His Holiness Dudjom Rinpoche, when Repkong Lama Tharchin Tsedrup Rinpoche enthroned her in 1992. Based on forty years of vajrayana study and practice in Canada and the United States, her knowledge is strengthened by personal retreats, competence in literary Tibetan, and personal guidance received from the 16th Karmapa, Kalu Rinpoche, His Holiness Dudjom Rinpoche, Dungse Thinley Norbu Rinpoche and Lama Tsedrup Tharchin Rinpoche. As a Dharma teacher and sangha leader, Lama emphasizes knowledge, authenticity, and connectedness. In 2002, she established Jnanasukha Foundation, a not-for-profit organization, as a venue for the teachings and example of Yeshe Tsogyal and the female buddhas. The Foundation sprouted several significant initiatives such as annual support for Tsogyal Latso, the birthplace of Yeshe Tsogyal in Tibet and programs for scholarships, grants and humanitarian aid. Since 2009, Lama has traveled to Tibet every year, leading pilgrimages and deepening her learning and connection to her spiritual home. Lama's early activities included textile arts, stone sculpture and careers in sociology and body-based psychotherapy. Born in Montreal, Canada, in 1949, she has lived on the Big Island of Hawai'i since 1986 at the request of Kalu Rinpoche.